ABQ RIDE may be celebrating a golden anniversary in 2015, but the department’s roots actually go back 87 years. That’s when the department’s forerunner, the privately-owned Albuquerque Bus Company first began service. On Jan. 1, 1928, buses that only days before had been plying the streets of Casper, Wyoming were now providing Albuquerque with regular bus service. And driving those buses were a cadre of motor coach operators, initially brought over from Casper. 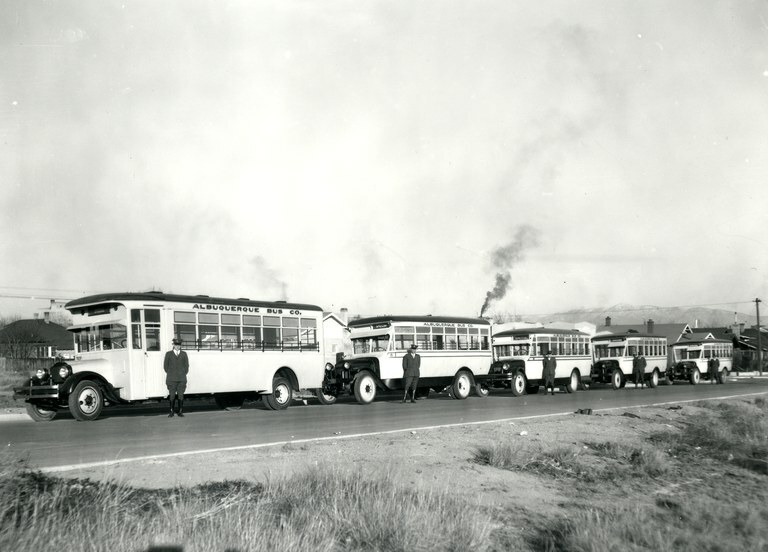 Eventually, they were replaced with local drivers, which according to ABQ RIDE archives were dressed in a uniform that included woolen jodhpurs (riding pants), cross-belted jackets, knee-high boots and caps. When motor coach operators first wore those dashing uniforms, they only had to navigate a handful of routes revolving around Downtown. They encompassed Central from Old Town to UNM, Edith Street, the Barelas-Sawmill area and North 4th Street. As the routes multiplied and expanded over the years, so did the number of motor coach operators. By the 1950’s, the fancy jodhpurs and belted jackets of the ‘20’s had been replaced by ties and peaked caps. 80 spiffily-dressed Albuquerque Bus Company drivers became city employees in 1965 when the company became the Albuquerque Transit System. The name eventually changed to Sun Tran, and in 2004, to ABQ RIDE. The changes over time also dictated a change in driver training. Some MCO’s also became Sun Van chauffeurs, to handle the specialized Sun Van service. Customer service was always emphasized. However, gone were the days of taking and making change for the farebox. Training became more technically-oriented, as motor coach operators and Sun Van chauffeurs now learned to input routes and fares into a computerized farebox and no longer handled money. What also changed was the makeup of the staff. Throughout its history, ABQ RIDE’s driver seniority lists were always topped by men. It remained that way until late 2013. That’s when for the first time ever, a female driver, Patty Sandoval, claimed the top spot on the seniority list. “When I started, there were very few woman driving. And there was always someone above them in seniority,” said Patty, in a 2014 interview. “I never even thought I would ever be Number One, anytime.” She finally gave up that top spot when she retired in November, 2014. Throughout April, ABQ RIDE will celebrate its legacy of top flight Motor Coach Operators and Sun Van Chauffeurs with a series of small celebrations for them at both the Yale and Daytona maintenance yards.